At Bagel King . . .
We never par bake anything. 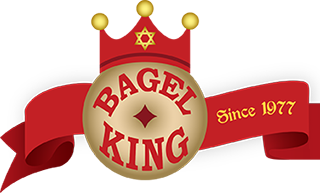 A par baked bagel involves the mass production of dough which is then partially baked and frozen before being shipped to a store where it is then finished and served. The entire bagel remains soft in this process, so the outside never gets toasted. We don’t freeze our dough, and we don’t par bake. Instead, we kettle bake our dough. Our dough is made fresh every day, hand rolled, kettle dipped and baked. This process moistens the bagel and allows the crust of the bagel to toast while the inside of the bagel remains soft. The result is a classic New York style bagel like none other in Central Florida. Schmear? We make over a dozen varieties of homemade cream cheese. They include plain, plain lite, fat free, chive, bruschetta, veggie, strawberry, almond amaretto, smooth lox, chunky nova, garlic herb, sun-dried tomato along with seasonal varieties around holidays.